If you carrot all about your health, pepper your day with silly puns and kale me in the morning! Did you know if your neighborhood kids squash a pumpkin you can still make a squashed pumpkin pie? Those kids might say, “We dig those folks! They’re radish!” And they might even yell “Lettuce eat it!” Then have one of your kin pump a squash (the big butternuts that look like barbells) but then they’ll really think you’ve lost your ground cherries. They know you’ve got your dog collard, but that scallion in the pasture, they know better than to bean him! You might think it was the leeks which caused our good sense to go down the drain, but picking carrots is what has led to many of the over the top puns this year, including a few that can’t be beet. If you are sage enough to turnip any more, please lettuce know, unless you think all these puns should be chard! Fall food is taking center stage now, as tomatoes and peppers wind down. We might have a few of those summery fruits this week, but less and less as the days go by. We had a patchy frost Saturday night — so close that the ground cherries were nipped but the cherry tomatoes were not. Either the ground cherries are more tender at a warmer temperature (like basil at 34 degrees), or the cold air at ground level in that part of the field was just at 32 and a few feet higher it was 33, or 32.5. Many thanks to Martin — while we were away for an overnight trip this weekend, after the wind died down he did the evening covering and turning the irrigation on to protect the peppers and remaining rows of tomatoes. Hard to say if they would have skirted through like the cherry tomatoes did, but it was too close for comfort, and we’re really glad he did all that. A more thorough frost seems close still — maybe even later this week we’ll really have to say goodbye, we’ll see. So for veggies in your share, broccoli, cauliflower tomatoes and peppers are also slowing down, but the rest of the lineup is holding steady. For this week we’ll be adding in dino/lacinato kale, and watermelon radishes, and next week we’ll start picking parsnips and brussels sprouts. Almost everything should get a little bit sweeter with the frost, but the most notable is usually the spinach and the carrots. For sweet potatoes, we’ll be putting out dirty ones for you to choose, alongside the clean ones– dirty ones store longer. The clean ones are reliable for a few weeks, and in our house they get eaten before then, but if you want to keep them longer we recommend taking dirty ones. Spinach is slowing down. There is some green stuff out there, but more and more of it is yellowing before sizing up. There will be less in the share, but we should be able to scrounge enough for 1/2 of a clear bag, for the next few weeks. Last week we left some leeks laying around in the barn for a couple days, and Martin thought those looked pretty yellow, but then he went out to pick spinach, and compared to the spinach field they looked pretty green! For radishes, we will have plenty of watermelon radishes, and maybe a few of the black or small red ones, plus daikons. Everything else should still be going well. A good frost or two will help sweeten up anything that’s still out in the field, it will be interesting to taste any differences as they evolve. Happy fall eating! Ground cherries seem to still be good, the ones in brown husks that already matured before the plants frosted. More frost would take the cherry tomatoes, tomatillos, and most of the flowers. Raspberries can keep going through light frosts, though the flavor can go downhill a bit. There are still a couple weeks worth of berries out there, but they might not all ripen with the cold. This week’s selection is : Garlic for $1 / head, Lettuce Mix for $5 / lb, Carrots and Beets for $1 / lb, Kale for $3 / lb, Winter squash, most varieties, $.75 / lb. Garlic can always be purchased in the barn, no need to pre-order. Last Share Pickups are Monday October 28th and Wednesday October 30th. We will not be doing Friday pickup that week. Friday people, if you haven’t done so already, please sign up via email or in person for Monday or Wednesday of that week, or if you can’t make it those days we will happily save a share aside for you to pick up another time. We apologize for any inconvenience this may cause; we’re trying it out to help us get a jump on putting the farm to bed and harvesting the last carrots, beets, celeriac etc for the storage share. Thanks for helping! A deposit of $10, or the full amount, will hold your spot. Potatoes and sweet potatoes we haven’t finished harvesting yet but from digging a few, yields seem to be ample. 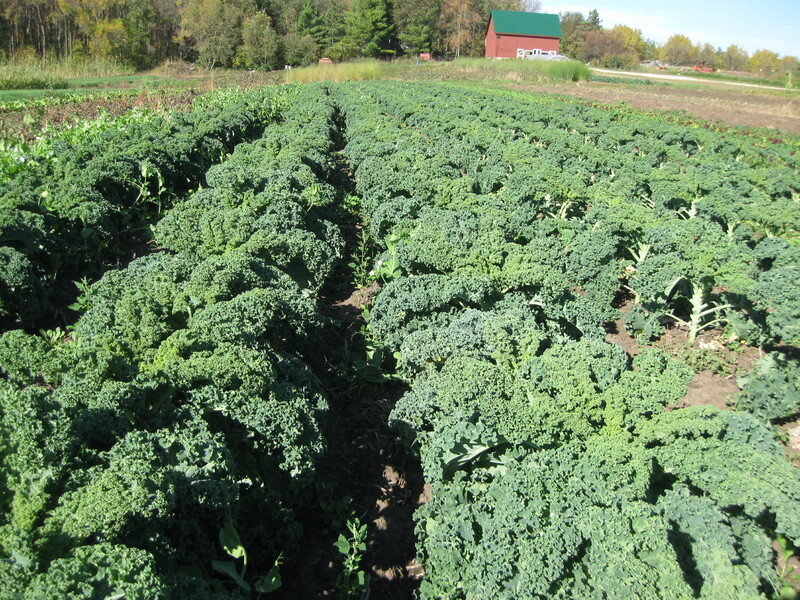 Cabbage might be all gone since it all came in so early; brussels sprouts, cabbage and kale are cold-hardy but if we get January cold in early November then they might be in short supply. Everything else is certain as certain can be in an uncertain world. Share Pickup Hours — Monday, Wednesday, Friday 2:00-6:00pm. You can U-Pick any time. Bring a pot of salted water to a boil. Add the celery root and cook for 1 minute. Drain well and rinse under cold running water until cool. Combine the celery root, apples, and walnuts in a medium bowl. Sprinkle with the lemon juice and sugar. Add the mayonnaise and mix well. Season to taste with salt and pepper. Let stand for at least 30 minutes to allow the flavors to develop. Taste and add more lemon juice, sugar, salt, and pepper as needed, and serve. You can hold the salad in an airtight container in the refrigerator for up to 4 hours before serving. Kitchen note: To toast walnuts, heat a large dry skillet over medium heat. Add the walnuts and toast, stirring frequently, until fragrant and lightly colored, about 5 minutes. Preheat the oven to 500˚F, with the rack in the lower third of the oven. Lightly oil a half sheet pan (preferred) or large shallow roasting pan. Mound the sweet potatoes and shallots on the prepared pan. Drizzle with the oil and season with salt and pepper. Toss to coat. Arrange in a single layer on the pan. Do not crowd the potatoes or the final texture will be soft and mushy. Roast in the lower third of the oven for 20 to 25 minutes, stirring or shaking the pan once for even cooking, until the potatoes are tender. Combine the roasted vegetables, cranberries, and almonds in a large salad bowl. Toss to mix. Pour in the dressing and toss until fully coated. Taste and adjust the seasoning. Serve warm or at room temperature.